Cutting the Cord and Cutting the Bills: Your input wanted! If you like these posts, here is an easy way to help out. Many of the social networks have systems for rating and sharing content that you like. I've added buttons for some of the popular networks to make this simple to do. I especially think it is cool to see the counters and it provides more feedback on what people like to read about. This helps plan future blog posts. Digg, "Facebook Share", and Twitter buttons should now be at the top of every post. When you view a post by itself, you should also see a "Share This" button (with a pop-up and a ton of services). 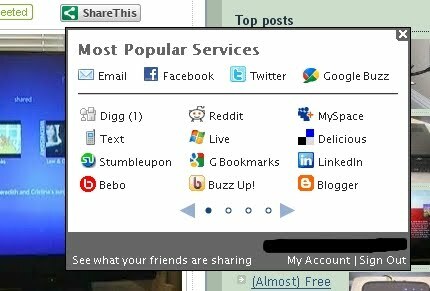 Reddit, StumbleUpon and "Facebook Like" are at the bottom (only because I didn't want to crowd the top). FYI: See this for differences between Facebook Share v.s. Like. "Likes" are quick, but "Shares" have a bit higher profile. Thanks for sharing, voting, stumbling, digging, etc. and keep the comments coming.